“When can cannabis seedlings be put under lights or in the sun?” is a common and sensible question that is often asked by novice cannabis enthusiasts after germinating seeds indoors under lights. For those who are growing indoors, cannabis seedlings may be put under lights as soon as they emerge from the soil or growing medium. How much light for cannabis seedlings? Cannabis seedlings growing under lights should always be given a gentle breeze from an oscillating fan (a small household fan on the lowest setting is fine), as constant gentle movement will strengthen their stems significantly. Are your cannabis seedlings falling over? If cannabis seedlings grow tall and then fall over, this is almost always a result of growing in an environment with static air. 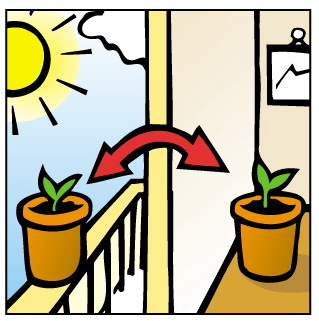 Seedlings intended for outdoor growing should be kept by a sunny window for the first week or two after emerging from the soil. When they have grown their second or third set of serrated leaves (after the the round cotyledons that initially emerge from the seed) seedlings are usually hardy enough to flourish in direct sunlight. When to plant your cannabis seedlings outside? If outdoor temperatures are suitable, seedlings may be acclimatised to direct sunlight by giving them progressively longer daily exposure to outdoor conditions. Starting with about three hours outside, at the sunniest time of day, seedlings can be given an extra hour of outside exposure each day, so that within about two weeks they can be left outdoors permanently.